3 Reasons Brave Thrill Seekers Will Love Exciting Kanab Zip Line! Kanab Zip Line is one of the most exciting ways to experience the amazing natural views of Southern Utah. Fly through the air at speeds of up to 35 miles per hour and at heights of up to 350 feet! If you’re a family of adventurers with a love for the beauty of the desert, a day with Kanab Zip Line is something you’ll never forget! 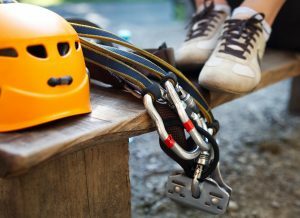 Before you head out for an exciting day at Kanab Zip Line, make sure you take a look at our Local Area Guide. It’s full of information about activities in Brian Head, Duck Creek, and Panguitch that your whole family will enjoy! There are so many ways to enjoy the natural beauty that our area has to offer, and the Local Area Guide lets you see it all in just a few clicks! Check it out, and begin planning your ultimate family getaway today! 3 Reasons to Love Kanab Zip Line! The builders at Kanab Zip Line are no newbies to this kind of excitement. In fact, they built their first zip line in the mid-1980s at a California water park. They’ve come a long way since then! Kanab Zip Line is the fourth zip line course they have built, and they consider it their best yet! 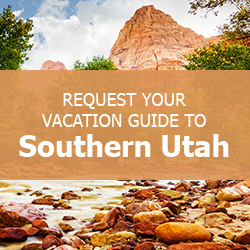 Noted as the “Crown Jewel” of their experiences, it’s an adventure you won’t want to miss on your trip to Southern Utah! The Launch Camp at Kanab Zip Line sits high on the mountains of Kanab, at an elevation of 5,280 feet! The very first run is 1,100 feet across the desert canyon, and it’s full of amazing valley views. The second and third portions of the course are about 400 feet each, and the final is 650 feet. By the time you reach your final destination, you will have traversed more than 2,500 feet over one of the most scenic areas in the southwest. The competitive members of your crew will love runs three and four, which allow you to race side-by-side! Kanab Zip Line is located on 40 acres of beautiful desert panoramas. The best part – it’s completely untouched! This authentically natural landscape is teeming with life. It’s amazing to watch this natural ecosystem live and breathe when you experience this zip line near Zion National Park. In order to preserve the stunning beauty of this place, the folks at Kanab Zip Line has made it a point to create guest paths disturbing as little of the natural flora as possible. After you have an awesome time soaring through the air at 350 feet with Kanab Zipline, come back to one of our gorgeous vacation homes to rest and refuel! Our properties are the perfect place to settle in, spread out, and continue to bond and relax with your family. Filled with amenities and tastefully decorated, Family Time Vacation Rentals have everything you need to relax after a stimulating day outdoors. Contact us today! We look forward to helping you make memories during your next family getaway! Everything You Need to Know About Dixie National Forest in Utah — 4 of the Best Panguitch, Utah Restaurants Your Family Will Love!